Last year I enthusiastically reviewed Animal Planet Visual Encyclopedia. Filled with hundreds of great photographs and chunks of information, this visual encyclopedia is highly engaging and informative. Now, Animal Planet and Charles Ghinga bring us something kids will definitely love but parents might want to avoid - Strange, Unusual, Gross & Cool Animals. Once again, fantastic photos and chunks of information scattered across the pages make for a visually engaging book. 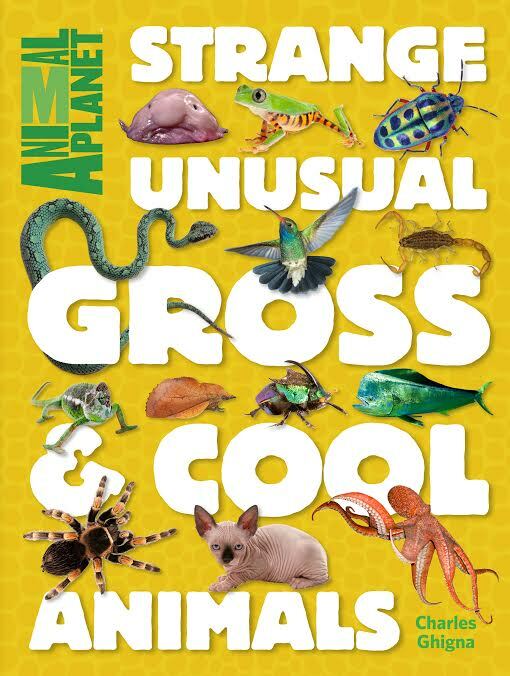 And, true to the title, Strange, Unusual, Gross & Cool Animals is divided into four sections, one for each descriptor! The book is divided up further with Gallery spreads, Featured Creatures, Creature Collections and Macroviews of specific animals. "Creature Features" boxes can be found for Featured Creatures, letting readers know the scientific name, class, length, habitat, diet, range and conservation status. 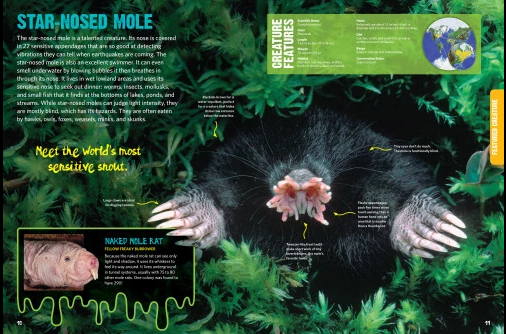 Featured Creatures also devote a portion of the page to a different animal that has a similarly strange, unusual, gross or cool trait like the star-nosed mole and the naked mole rat. No doubt, the chapter titled Gross, with a two-page spread on poop, another on animals that vomit and my favorite spread on "Blobby, Slimy, Stretchy Creatures," featuring some really weird slime mold, will be the big draw for readers. To me, every animal and insect in this book is strange, unusual, cool and occasionally a little gross. 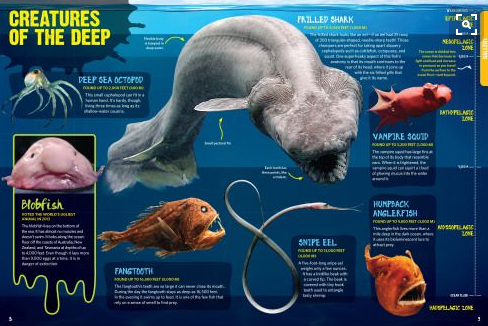 I especially like the page on Newly Discovered Creatures where I learned about the Ghost Octopus, which has no pigment and the Peacock Spider, which was discovered in Australia in 2015! It is amazing to me that new creatures are still being discovered. Back matter includes a glossary, further reading suggestions and an index.